A lot of factors contribute towards making a holiday memorable; a great stay and a comfortable vehicle being two very important ones amongst them. As holiday seasons approach, not only does it get difficult to get a decent hotel room at a reasonable price but booking a good car rental service also seems like a challenge. We expect a lot of things from the car rental we choose and compromising on any of it implies compromising on the fun and quality of your holiday. Choosing the right car rental is already a tricky task in the first place as it involves so many smaller details that can lead to a bad decision. As much choices you get in something, more challenging it becomes to differentiate good from better and better from best. Just like you smart shop for other important things, few smart ideas and steps can help you in making the right decision in the case of a car rental too. 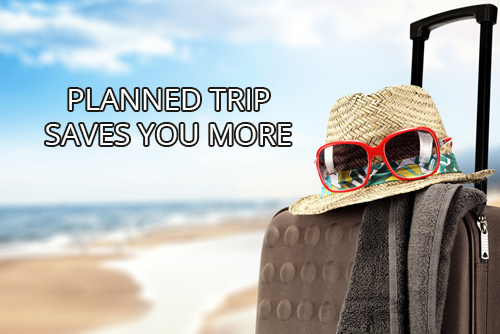 We mostly plan holidays well in advance with a few exceptions of spontaneous weekend getaways. Longer the holiday, larger is your rental bill so make sure you get ahead on the rates of rentals around the time you are planning the holiday. If it's going to be a busy season during that time, then advance booking can be a good idea to save on the rent. Although, advance booking should only be made when you are sure about the date and time of the requirement as most of the car rental services are largely inflexible about refunding or changing the bookings. Don't restrict your thinking to only one or two car rental options. Know that there are plenty options available in the market and with every other enterprise car rental you will get acquainted with some new schemes, rates, discounts, etc. So, make sure you indulge in plenty of research work before you settle for any one option. Also, in most cases, the rates you find available online are less than the rates you will get offered on the spot or at the rental office. Thus, some quality research can save you big bucks. Not only while selecting the car but also after getting it you can save a large amount of money with some smarter hacks. Some very common and easy ways to turn your car rental into an economical car rental is by ditching the booking of a driver with the car in a case where driving at your end is not an issue. Avoid booking a car with GPS installation in case your mobile is equipped with maps facility as a car without GPS stands cheaper than the former option. Also, choose a car size that is best suited to your needs instead of booking an unnecessarily large car as compact ones have lesser rental rates. Booking around the weekend at weekend rates is also hugely economical. Getting the fuel tank filled by yourself is also one of the popular options in this category. Saving with the help of discount coupons around special occasions or through special discount sites also will make your car rental service more economical. Make sure the discount is true to its nature and amount, and there are no hidden conditions or loop-holes that might end up wasting your precious money. Be smart and cautious while selecting the unlimited km option too as most companies often exploit this option by keeping out some areas or out-of-state travels from it. Be smarter on your part and prepare well before you start dealing with any car rental companies. As beneficial and helpful they might sound while planning a trip, a wrong decision on your part can easily throw all your budget off, sending your hard earned money into their pockets.